During this day long class you will learn how to use flax roving to shape a beautiful fiber bowl, box or collage. This is an easy and fun technique with endless possibilities. 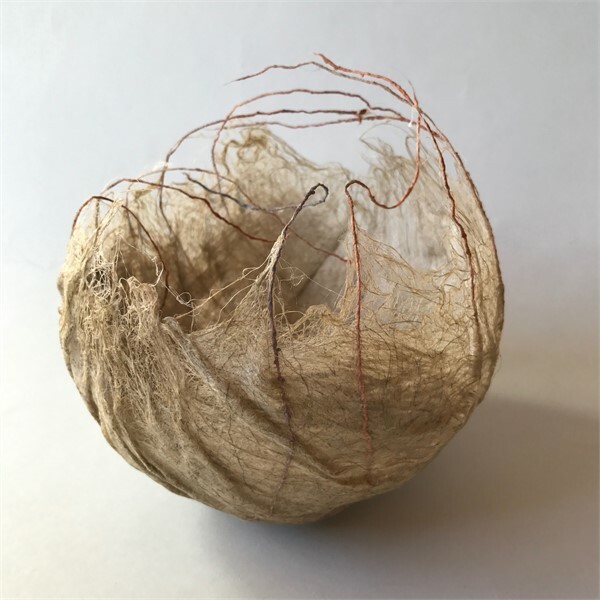 The finished dried sculpture can be embellish with materials of your choice such as ink, paint or stitching. I will provide all materials. Students are encouraged to bring the following: scissors, 12" ruler or measuring tape, wire snips. The sculptures I create are small installations made with rattan, natural materials, kozo and indigo and sumi ink. The intention is to evoke a sense of place and one’s relationship to that place. To pause and reflect on the beauty within. My work is ethereal inspired nature forms.